Four busy moms share not only their formula for starting a soup club--which gives you at least three meals every month when you don't have to worry about dinner--but also 150 fantastic recipes for soups and sides and storing tips for stretching those meals across the week. The Soup Club began when four friends (who, between them, have four husbands and ten hungry kids and several jobs) realized that they didn’t actually have to cook at home every night to take pleasure in a home-cooked meal. They simply had to join forces and share meals, even if they weren’t actually eating them together. Caroline, Courtney, Julie, and Tina happen to be neighbors, but a soup club is for anyone: colleagues, a group of workout buddies, a book club. All you need are a few people who simply want to have more home-cooked food in their lives. In a soup club each person takes a turn making soup. Soup is forgiving, versatile, and perfect for sharing; it can be spiced to taste, topped elaborately or not at all, and dressed up or down. It travels well and reheats beautifully. 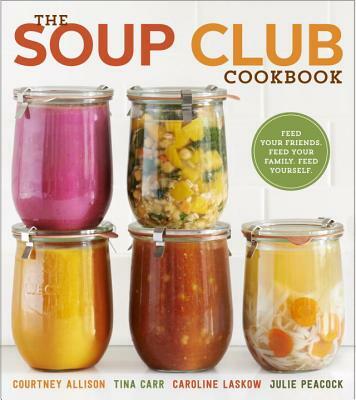 The Soup Club Cookbook also has dozens of tips for cooking in quantity and for tailoring soup to individual tastes and needs. Here, too, are simple guidelines for starting your own soup club, anecdotes, and a few cautionary tales that will inspire anyone to share food and eat well. Courtney Allison, Tina Carr, Caroline Laskow, and Julie Peacock are neighbors in New York City. They have been food-sharing for many years and this is their first cookbook. They recently appeared on Good Morning America to share their tips for sharing soup with friends.